Super cute garden item or paper weight desk item. 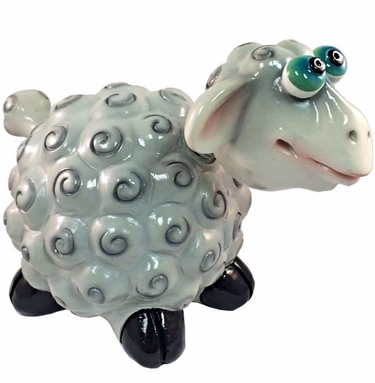 You can't go wrong with this little Sheep Phatzo decor! 18" Dream Wind Chime | 8" LED Animated Santa House | Large Yellow Fairy Garden Stakes (Set of 2) | 20" Blue Geckos (Set of 2) | Solar Windy Wavers - Flower | Slate Garden Markers (5-pack) | Silver Peacock Decor (Set of 2) | Set of 4 Finch Sunflower Stakes | Lion Wobbler | small moose phatzo | Small Sheep Phatzo | Small Pig Phatzo | Solar Dragonfly Lantern | Dodo Birds Holiday Stakes - 2 Dozen! | Solar Christmas Holiday Stakes (Set of 3) | Glow Anywhere LED Christmas House | Gnomeo & Juliet Garden Stakes (Set of 4) | Travelocity Gnome - Hawaii | Elton Gnome Statue w/Piano Collectible | Solar String Lights - 50 LED Red White Blue | Bee & Ladybug Bird Feeder Combo!